If your stomach is giving you problems, you should begin trying to find ways to improve digestion. 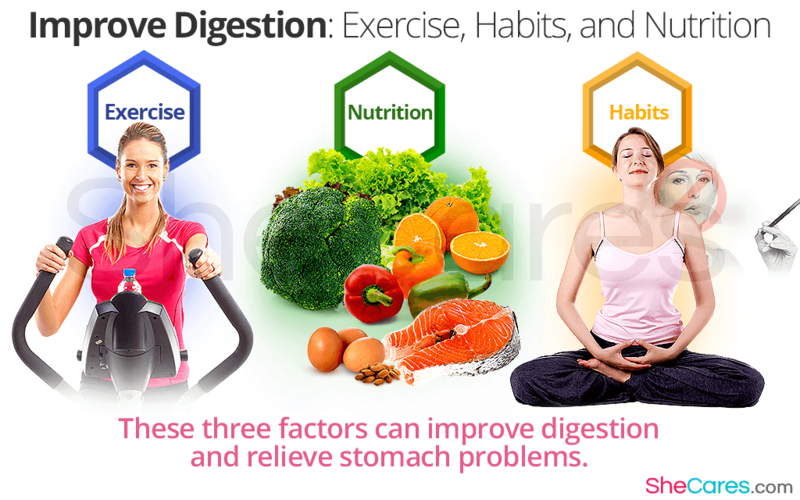 There are a number of ways you can influence your digestive system and begin to get your digestion healthy again, but the three most important factors are exercise, nutrition, and other habits. Exercise can help keep many areas of the body running well, including the digestive system. Exercising helps improve our muscles and blood flow, which both help make digestion more efficient. It also helps keep digestion moving quickly, making constipation and other problems less likely to occur. Additionally, excess weight can cause digestive problems. While many people are overweight for reasons outside of their control, trying to start getting regular exercise to lose a bit of weight can improve digestion and relieve stomach problems. A healthy diet is essential for healthy digestion. Eating the right foods is good for all of your body, but it's especially good for your digestive system, which has to process the foods first. Foods containing fiber are especially important for digestion, because fiber is what keeps food moving through the intestines regularly. For most women, eating a balanced diet without too much sugary, fatty foods is enough to keep the digestive system working well. There are specific diets for certain conditions, as well: people with lactose intolerance should avoid dairy (i,e; unless taking the right medication to be able to digest it), and people with celiac should avoid gluten. Some foods can be extra difficult for the digestive system. Cheese, spicy foods, fried fatty foods, and acidic foods are some of the most common culprits for digestive issues. Avoiding these foods, or at least eating them in moderation, can help to keep digestion healthy. Certain habits may unexpectedly affect digestion as well. Smoking, for instance, can cause many problems in the digestive system, increasing the risk of illnesses such as ulcers, heartburn, Crohn's disease, polyps, and gallstones. Breaking your smoking habit can therefore have a very healthy and beneficial effect on your digestive system. Relieving stress is another way to improve digestion. Studies have shown that stress can have a significantly negative impact on digestion, causing anything from an unspecified stomach upset to intense pain or constipation or diarrhea. Ulcers have also long been associated with stress, although their actual cause is related to bacteria. Finding ways to keep your stress levels down through yoga, meditation, or another habit can help improve digestive health. Knowing how to improve your digestion and digestive health can help you begin to implement the new habits to keep your body working right. To learn more about improving digestion, read about some important vitamins for digestion.